Posted on Monday, June 2nd, 2014 at 1:15 pm. 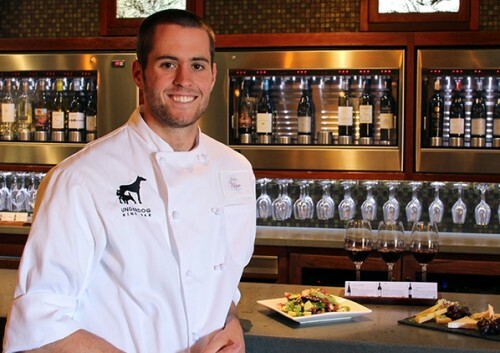 Chef Chris Corey has lived in eight different states and worked every position possible in the restaurant industry. His experience in wine bars, catering companies, family restaurants and bars has brought him to his newest position as the Executive Chef of Underdog Wine Bar and Lounge. Now he is enjoying the view and the bountiful produce of the Livermore Valley Wine Country terroir. His experimentation and passion for the quality of the vegetables, grapes, meats, and seafood that comes from the area is sure to shine at this year’s Taste Our Terroir and we are anxiously awaiting to taste. 1) When did you first know you wanted to be a chef? I knew I wanted to be a chef my Junior year of High School. 2) What is terroir to you? Terrior is everything that makes your exact location special. The wind speeds, temperature, rain flow and amount of day light. 4) What is the biggest challenge in food and wine pairing? For me the biggest challenge is understanding and identifying the flavors, mouth feel, and body of each individual wine. Having the ability to extract that information and applying it to food is a difficult yet fun experience. 6) Favorite meal of the day? 7) Go to meal to make? 8) If you could pick one person to cook for you, who would it be? 9) One ingredient you couldn’t live without? 10) Three words that describe you?